We’re excited to announce the launch of Anycast DNS Hosting! It is automatically configured on our Shared and Reseller servers. For those of you who are already familiar with Anycast DNS, you know the speed and reliability benefits that it offers. For those of you how aren’t familiar with Anycast DNS, you’ll find a complete explanation of IP addresses, DNS and the benefits of Anycast DNS below. The first thing to understand is that computers communicate and identify each other through the use of IP addresses. We use words to communicate. Computers and networks use numbers. In fact your site requires an IP address in order to be visited because that’s how your site is identified on a server. In short, anyone who wants to visit your site must have this IP address. Have you ever typed an IP address into your browser to visit a site. I would venture that you haven’t. You type in a domain name. This is where DNS comes into play. DNS is essentially the phone book of IP addresses. Don’t know what a phone book is (OK I use my phone book as a door stop as well)? Simply put, DNS is a database of IP addresses and network names. It’s the Domain Name System. When you type a domain name into your browser, DNS springs into action to translate the domain you typed into the IP address associated with the website. Once the IP address is found, your computer can connect with the web host and the page is displayed on your browser. With traditional DNS, your site’s DNS record is stored on a DNS server in a single location. Imagine that your DNS record for your site is stored in the US and your visitor is located in the Amsterdam. It can take awhile for the DNS server and your visitors’ computer to communicate. This can ultimately slow down the performance of your website. We don’t deal with “slow” at A2 Hosting. How Does Anycast DNS Improve Performance? A2 Hosting has data centers with servers located all over the globe. 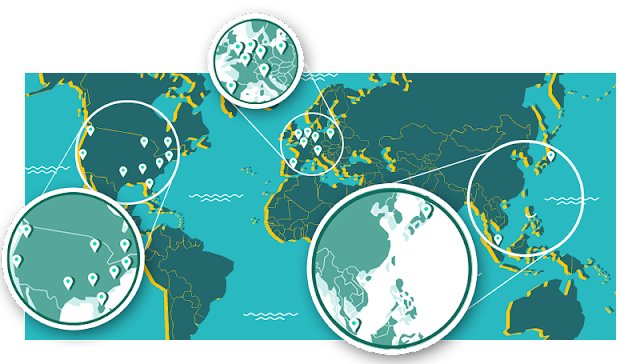 Instead of a DNS record stored in a single location, Anycast duplicates your DNS record across our globally located network of servers. This brings your DNS record much closer to your visitors who are located around the world. Anycast in turn automatically directs your visitors to the DNS server located closest to your visitor ultimately fulfilling their request much quicker than traditional DNS. If your visitor is located in Amsterdam, instead of requesting the DNS record stored in the US, your visitor can grab the one in Amsterdam where they’re located. The bottom line is Anycast helps your site load faster. With both traditional DNS and Anycast DNS, a DNS server can become unavailable. That’s just reality. However if you’re using traditional DNS, your DNS record isn’t duplicated on any other server locations. This means there’s no guarantee that your visitors will be able access your site because the domain name to IP address conversion may not be able to occur. Obviously that’s not a great situation. On the other hand, remember that the DNS records with Anycast DNS are duplicated across multiple locations. If one DNS server with your record goes down, the request will be routed to the next nearest server where your DNS record is located. Anycast DNS offers ultimate redundancy. While that may not be the server located closest to your visitor, the domain name to IP address conversion can take place and your site will remain accessible by your visitors.